New Years Eve Update » New Years Eve At The Pilot Tavern and Mark Breslin's 5th Annual Massey Hall New Year's Eve Comedy Extravaganza. Happy Holidays » Season Greetings From The Wine Establishment. Shareholder Alert » InterRent Shares Listed For Trading On Frankfurt Stock Exchange. Shareholder Alert » InterRent Announces Sale Of GTA Multiresidential Property. Newsletter 12.05 » Larra Skye, Monkey Toast presents: CONSPIRACY NIGHT!! !, The Ultimate Seasonal Swing Dance Party!, New Years Eve @ The Pilot Tavern, and Luis Mario Ochoa events. Fall 2005 » Tax Planning Checklist - Year End Tax Planning, How To Build Long-term Value, Why Income Trust Conversions Still Make Sense, Highest M&A Activity in 5 Years: How to Succeed with your Acquisition or Exit Strategy?, Corporate Finance and recent transactions Tombstone. Events Calendar » Jazz @ Lula, Montuno Police, David Buchbinder's Flying Bulgar Klezmer Band, Cuban Fridays, Salsa Saturdays, and contest. e-News Update » Serafin National CD Launch for "2am At The Torch Café" @ The Mod Club, and RJO @ Bloor Street Entertains. Rainha Do Samba 2005 » Brazil Nativa and Samba Explosion, Sambacana w/ Cibelle Iglesias & Marcelo Neves, the Escola de Samba de Toronto perform it’s new samba, De Leste a Oeste de Norte a Sul. Newsletter 11.05 » Richard Underhill, Serafin, Little Big Horn: A Tribute To The Trumpet, Larra Skye and Luis Mario Ochoa events. e-newsletter launch » New Jersey based accounting and financial consulting services firm launches introductory newsletter w/ special feature to enable community to select their delivery preference. e-newsletter » Quote of the Month, Jason Gringler Opening Night, Christopher Moore Upcoming Exhibition, Kim Dorland Review, Angell gallery @ AAF New York, 2006: Angell ‘10’, Angell artist news, and Upcoming Exhibitions. Shareholder Alert » InterRent Continues Rapid Growth With Agreement To Acquire 111 Apartment Suites in Belleville, Ontario For $4.995 Million. Shareholder Alert » InterRent Secures $1.2 Million Credit Line. DNAMuseLETTER » Upcoming Performances and DNAMuseNEWS. 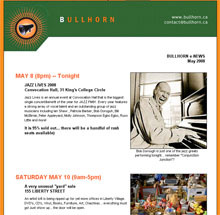 Newsletter 10.05 » Nash The Slash, The Wet Spots, Dee Kaye Ibomeka, Hilario Duran, The Men’s PowerSpa, Richard Underhill and Serafin events..
Events Calendar » Jazz @ Lula, Gary Topp Presents Sun Ra Arkestra, David Calzado y su Charanga Habanera, Cuban Fridays, Salsa Saturdays, Ralph Irizarry & Son Café, Hilario Duran Trio & Beto Caletti, and a Chet Baker Tribute. Wine Cellar Sale » Canada's Wine Cellar Specialists Building Trust for 20 Years. e-newsletter » Quote of the Month, Luke Painter Opening Night & Reviews, Jason Gringler Woods Exhibition, Affordable Art Fair, Double Exposure 2005, 2005 Art Awards Gala, Kristine Moran and Jason Gringler @ RBC Canadian Painting Competition, Angell artist news, and Upcoming Exhibitions. Events Calendar » Jazz @ Lula, Small World Music Festival, Gary Topp Presents Sun Ra Arkestra, Badi Assad, Cuban Fridays, Salsa Saturdays, Ralph Irizarry & Son Cafe. 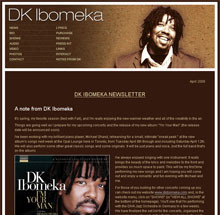 e-newsletter » Launch of the Dione Taylor fan club newsletter. Items include recent news and upcoming events for popular contemporary Jazz singer. Shareholder Alert » InterRent International Properties Inc. Announces Closing Of Financing. Newsletter 09.05 » Crispin Glover, Serafin CD Release, Good Vibes: A Tribute to The Vibraphone, Joe Hall and The Continental Drift Reunion, Alex Pangman, Larra Skye, Richard Underhill And Serafin Meets Nash The Slash events.. Toronto's newest public relations, marketing and communications firm, specializes in event co-ordination, product launches, film and theatre openings, art exhibits and charity fundraisers. Fall News & Events » Brazil Independance Day Celebration with Sambacana. Samba Toronto presents a Fall Workshop w/ Alan Heatherington at the Royal Conservatory of Music. Gifts & Incentives @ The Wine Establishment » Promotional publication to corporate customers about Wine Establishment custom design and unique gift suggestions. Shareholder Alert » InterRent International Properties Inc. Announces Agreement To Sell GTA Property. e-newsletter » Quote of the Month, Geoffrey Pugen Opening Night & Reviews, Luke Painter Pipe Dreams, Mois de la Photo, Montreal, Canadian Art Gallery Hop, Kristine Moran and Jason Gringler make RBC Canadian Painting Competition shortlist, Angell artist news, and Upcoming Exhibitions. Events Calendar » Jazz @ Lula, SMALL WORLD MUSIC FESTIVAL w/ Seu Jorge, Le Trio Joubran, and Hoven Droven, Cuban Fridays, Salsa Saturdays, Ralph Irizarry & SonCafe, plus contest. Business to Business email campaign for Greater Toronto Area's newest door-to-door unaddressed admail coupon booklet..
weekly e-newsletter highlighting exclusive travel, time-share and vacation deals for members. Shareholder Alert » InterRent International Properties Inc., Passes 1,000 Suite Ownership Milestone With New Property Acquisitions. Events Calendar » MOVIMIENTO! - The Urban Latino funk, hip hop and reggaeton explosion, Cristal Fridays, help Toronto's Daily Bread Food Bank w/ Evaristo Machado, comedian Martha Chaves, Toronto All-Star Big Band, Ralph Irizarry & Son Cafe, Practice Your Spanish @ Lula, plus contest. Shareholder Alert » InterRent International Properties Inc. Announces Third Quarter Results. First email campaign with new website graphics. In Performance » Montreal Bistro - Wednesday August 3rd. Newsletter » Charlie Watts, Dalbir Singh, Crispin Glover, The Wet Spots, View From The Gallery, 39th Annual CHIN International Picnic and Swing Rosie events. Toronto's newest public relations, marketing and communications firm, specializes in event co-ordination, product launches, film and theatre openings, art exhibits and charity fundraisers. Summer Edition » Managing Your Business - Staff Issues, Stock Options and Investment Tax Credits - CRA Agrees with TCC, Employer Health Tax, The Workplace Safety Insurance Board, Estate Planning and recent transactions Tombstone." Samba Toronto presents a 5 Day Summer Workshop - JULY 18-22 w/ Alan Heatherington at the Royal Conservatory of Music. e-newsletter » Quote of the Month, Nic & Sheila Pye Opening Night & Reviews, Geoffrey Pugen Aerobia!, ~scope Hamptons, Kristine Moran and Jason Gringler make RBC Canadian Painting Competition shortlist, Video Art, Angell art leasing and Upcoming Exhibitions. pr & media special » MOVIMIENTO! - The Urban Latino funk, hip hop and reggaeton explosion. Events Calendar » MOVIMIENTO! - The Urban Latino funk, hip hop and reggaeton explosion, Cristal Cuban Fridays, Energia Latina Returns!, Gary Topp Presents: Jesse Denatale, Ralph Irizarry & Soncafe, plus contest. e-newsletter » Inaugural edition of the Fastball e-newsletter with interesting updates about collectibles, memorabilia and, of course, sports cards. e-news special » Nicholas & Sheila Pye and Stephen Ibbott "Is Your Relationship A Work Of Art?" Spring Edition » Are You Ready To Sell Your Business, Registered Education Savings Plan ("RESP"), Internal Controls is the New Hot Issue Facing Canadian Reporting Issuers, Announcement: 2004 Bottom Line Magazine survey of Canada's largest public accounting firms ranks DMCT,LLP 30th largest Public Accounting firm in Canada, and recent transactions Tombstone." e-newsletter » Quote of the Month, Kristine Moran Opening Night & Reviews, Jakub Dolejs catalogue wins international design award, Nicholas & Sheila Pye, Is Your Relationship A Work Of Art?, Angell art leasing and Upcoming Exhibitions. Events Calendar » LULA 3rd Anniversary, Father's Day w/ Norman Amadio, Eliana Cuevas Quintet, Hilario Duran All Star Big Band + Trio, Adam Solomon & Tikisa In Concert. Event Reminder » "View From The Gallery Two" featuring award winning Canadian surrealist artist Robert Vanderhorst and Canadian music icon, Nash The Slash. Toronto's newest public relations, marketing and communications firm, specializes in event co-ordination, product launches, film and theatre openings, art exhibits and charity fundraisers. Special Tax News Edition. Province of Ontario Budget Review And Analysis » Ontario Finance Minister Greg Sorbara tabled his 2005 Budget in the Legislature on May 11, 2005. Budget Commentary is available for review. Wine In The Courtyard - June 19th 2005 w/ About Face » Food presented by Avalon, Prego Della Piazza, Fat Cat Bistro, Urban Restaurant, Rodney's Oyster House and The Cheese Boutique. Champagne reception hosted by Moet. Live Wine Auction by Ritchie's. Sampling Wines compliments of Jackson-Triggs, Robert Mondavi and Halpern Enterprises. Live Jazz with Juno Award Winner Bob DeAngelis. Events Calendar e-special» Community calendar e-newsletter w/ Festival Pass Contest. Lula Lounge celebrates its third anniversary with a ground breaking global music festival highlighting the diversity of Toronto and the musicians that have graced the stage at Lula for the past three years. 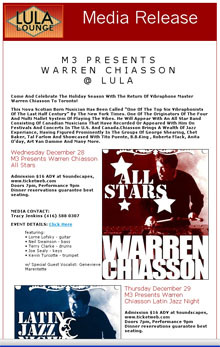 Public Relations And Media Release » Lula Lounge Celebrates Its Third Anniversary. Lula Lounge celebrates its third anniversary with a ground breaking global music festival highlighting the diversity of Toronto and the musicians that have graced the stage at Lula for the past three years. weekly e-newsletter campaign for leading trade and barter industry company with 22,000 members in North America. Events Calendar » INFUSE Festival, LULA 3rd Anniversary, Mothers Day, HONEY KATS and more. Festival of Chefs 2005 » Invitation to join The Wine Establishment at the 2005 Festival Of Chefs, hosted by Cheese Boutique. e-newsletter » Quote of the Month, Andrew Rucklidge opening & reviews, Kristine Moran Exhibition, Kim Dorland review, Beyond the Firewall review in Canadian Art, -scopeNewYork, Video of the Month, Angell art leasing and Upcoming Exhibitions. 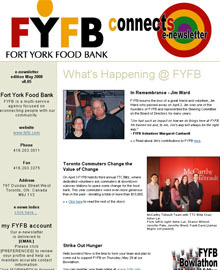 Inaugural e-newsletter for Toronto's newest public relations, marketing and communications firm, specializing in event co-ordination, product launches, film and theatre openings, art exhibits and charity fundraisers. "View From The Gallery" featuring award winning Canadian surrealist Robert Vanderhorst artist and Canadian music icon, Nash The Slash. Korongo Jam, Norm Amadio, Red Cabaret and Brazilian Dance Party w/ contest. Targeted email communications for entertainment media. special e-newsletter for members of the ITEX business exchange network. weekly e-newsletter promoting travel, time-share and vacation opportunities for membership. Bob Wills, Comedy Corner w/ comedian Martha Chaves and Broad Appeal, and Asian Arts Festival. Invitation to join The Wine Establishment at the The Toronto Wine & Cheese Show. March 3 4 5 Media Release & Community Notice for entertainment media and Lula Lounge Community audience. Preventing Fraud in Small Business, Attention Restructured Employer - Don't Overpay CPP and EI Contributions!, M&A Due Diligence: Moving From Ledgers to Talent, and recent transactions Tombstone." Invitation to the annual Wine Establishment inventory sale. Government of Canada Budget Review And Analysis » Finance Minister Ralph Goodale tabled his 2005 Budget in Parliament on February 23, 2005. Our Budget Commentary is available for review. Quote of the Month, Andrew Rucklidge exhibition, Kim Dorland Doubletake review, Geoffrey Pugen in Berlin and Upcoming Exhibitions. Carnaval at Lula!, Eliana Cuevas Valentine’s Concert, Adalberto Alvarez y su Son, Musica Eterna, Montuno Police. Jane Bunnett's Spirit Of Music Bash and Fundraiser, Evalyn Parry DVD Shoot, Carnaval at Lula!, Eliana Cuevas, Shivaree, and Smallworld Music Presents Indian Ocean Disaster Benefit Concert. Quote of the Month, Nic & Sheila Pye In New York and Berlin, Kim Dorland Doubletake, Stephen Ibbott, Owen Ford Signs review, Andrew Rucklidge UK Solo Show, Video Pick Of The Month, Berlin welcome's Geoffrey Pugen! and Upcoming Exhibitions. e-newsletter highlighting exclusive travel, time-share and vacation deals for members. Campaign launch for business services company leading the trade and barter industry with 22,000 members in North America. e-newsletter Trading Opportunities campaign launch for business services company leading the trade and barter industry with 22,000 members in North America. The Tropic Of Gryphon: Chamber At Lula Lounge, Jane Bunnett's Spirit Of Music Bash and Fundraiser, CBC Sunday Showcase Launch And Smallworld Music Presents Indian Ocean Disaster Benefit Concert.